Among the politically charged current events surrounding the nation and the campus, a bright light was the Students Against Social Injustice’s third annual Express YaSelf event. Held at the Knight Spot on Sunday Feb. 26, the event was a safe place for students to enjoy and to appreciate entertainment, socialization and education from peers. “Express YaSelf was sort of the brain child when we were all baby freshmen, and we tried to think of something on campus that was directly toward social injustice, activism and a safe space for all the activists on campus to come together, celebrate each other and then also bring awareness to different clubs that are doing different things,” SASI president political science major senior Sasha Miller said. During the event, multiple students performed an array of different talents, such as psychology major sophomore Kevin Vazcones’ impressive dance. Additionally, the event provided deep and meaningful slam poetry from Andre Doeman ‘15, Josh Roychowdhury ‘15 and history adolescent education major junior Ilana Turk. Their poetry spoke to social injustices in our country and around the world. Among the student performers, however, were representatives from certain activist clubs on campus such as Alpha Delta Epsilon sorority, One Love and Peace Action. This way, attendees could learn more about each respective organization. Express YaSelf not only presented many talents, it also fostered a larger sense of community. Considering recent events surrounding our country, this annual event came at the perfect time. Although this event was SASI’s biggest event of the year, they still intend to promote their ideas in any way possible. For example, they marched in the Solidarity Riot together as an organization on Friday Feb. 24. 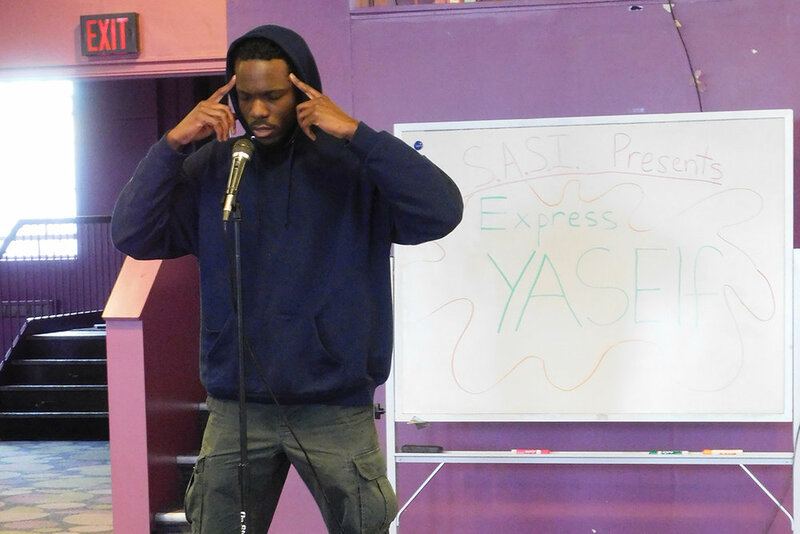 Express YaSelf was and continues to be an excellent way for students to “express themselves,” to communicate with other student activists and to make a change on our campus and ultimately our nation as a whole.